The United States Congress designated the Becharof Wilderness (map) in 1980 and it now has a total of 400,000 acres. 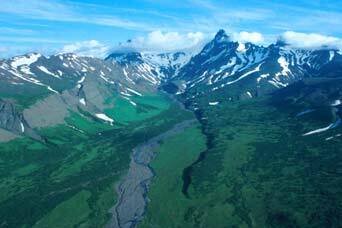 All of this wilderness is located in Alaska and is managed by the Fish and Wildlife Service. The Becharof Wilderness is bordered by the Katmai Wilderness to the north. Just where the state begins to slim down into the Alaska Peninsula, Becharof Wilderness extends from the northeast shore of Becharof Lake south to the Pacific Ocean and makes up roughly one-third of the Becharof National Wildlife Refuge. When the salmon spawn in the lake, which is just outside the Wilderness boundary, brown bears travel to the area in great numbers. On the coast, Puale Bay provides haul-out beaches for thousands of Steller sea lions and other sea mammals. Multitudes of seabirds come and go along a coastline which are cut deeply by misty fjords (steep cliffs falling into narrow saltwater bays). Wolves, moose, and caribou are also commonly sighted, attracting wildlife observers and photographers. From brushy wetlands to snow-pressed alpine vegetation, Becharof Wilderness provides pristine habitat to many significant wildlife resources, and offers many subsistence and recreational opportunities. Hunters experience unusually high success rates with bears and caribou. Bear precautions are in order. Average summer temperatures range from the upper 40s (Fahrenheit) to low 60s. Winter temperatures average well below freezing—ranging from 9 to 24 degrees in January—with 19.7 inches of precipitation falling annually. Planning to Visit the Becharof Wilderness? How to follow the seven standard Leave No Trace principles differs in different parts of the country (desert vs. Rocky Mountains). Click on any of the principles listed below to learn more about how they apply in the Becharof Wilderness.